There are so many ways to get to a 3D model. Some are really great if you like programming. It is really powerful to use logic to generate objects, but not for all models. Those who are better with visual modalities will probably not like such a system much, and will like the following. Besides scanning software, modeling software is also rapidly improving in terms of usability. There are already great pieces of software that can be used for 3D modeling of meshes. It already shows how you can make 3D modeling accessible and still be very powerful. I would like to think about how we can achieve both with relatively simple means and do it better than in Minority Report. It should be possible to implement this with off the shelf parts and open source software (something interactively adjusting blender’s perspective). The wii remotes could provide useful for head and cursor (or finger) tracking. To get a “3D screen” you could use shutterglasses to generate a stereoscopic interface, or you could even more cheaply create a lower fidelity interface by just adjusting the perspective relative to head movements. 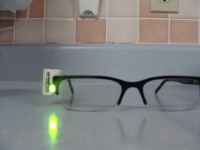 Or buy off-the-shelf LED glasses. Here you should probably still replace the LED’s with IR LED’s if you want proper contrast with the wii-mote setup. You could create a custom HID device or USB joystick with an Arduino. Or just put an off-the-shelf 5 euro (including shipping) IR emitter around your wii-mote or webcam. These 5 euro components are normally used for security cameras. Make sure you get one that it doesn’t block the camera’s view. Now the great thing about what you see is that it’s not THAT complicated!. Many of the parts for such an interface could be 3D printed (to exactly fit your body, you should sculpt the second iteration with the system from the first iteration). But I like the simplicity of a simple ‘3D mouse’ with buttons that has three markers, since most of the solution would be in software and anyone can easily get it working with standard webcams/wii-motes and software they can download. It’s easier to replicate such a setup. Another option would be to use a phone (android based) and connect it to you computer directly via bluetooth, or to your arduino prototype rig (via the amarino toolkit). freetrack is an open source tracking system, it’s mostly aimed at adding degrees of freedom to computer games, but perhaps it could be implemented in other software such as blender.